To see this piece at the Nichols House Museum, visit us! 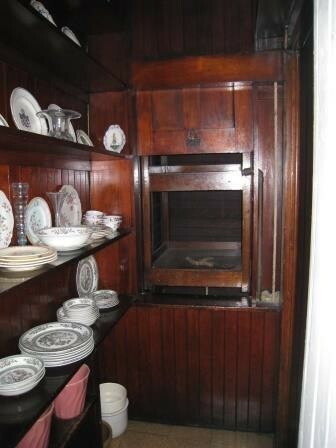 The antiquated wooden dumbwaiter at the Nichols House Museum is a popular feature of the semi-hidden butler’s pantry, located on the second floor off the dining room. This two-tier wooden contraption carried food, plates, and utensils from the kitchen on the first floor to the dining room on the second, saving time and energy. A fascinating piece of home technology built directly into the structure, it now silently hangs between the two floors it traveled so frequently. Its installation in 1897, however, gives an indication of the busy household it served 100 years ago. Looking down the Butler’s Pantry. The dumbwaiter is to the left, out of the frame. The Nichols household at the turn of the twentieth century would have included three live-in servants – a cook and two maids. There would have been other household staff, as well. [i] For larger dinner parties, extra wait staff would have been hired. The Nichols family built the butler’s pantry twelve years after they moved to Beacon Hill. 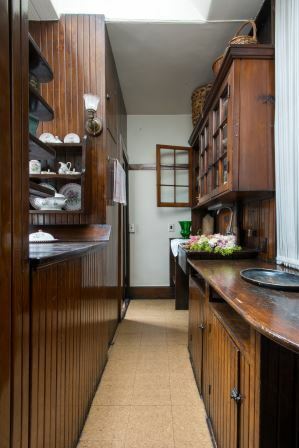 The butler’s pantry was a boon to the family and its staff, as it added a staircase connecting the first floor kitchen to the dining room, a sink, extra storage, and the dumbwaiter. Food could be sent up from the kitchen via the dumbwaiter, platters were stored on the new shelves, dishes could be washed in the soapstone sink, and servants could move between the dining room and the kitchen using the back staircase without disturbing the diners. The space also allowed for a final touch on the plated dishes before they were carried out to be served. The speaking tube connects downstairs into the kitchen. The dumbwaiter was an essential part of this hustle and bustle. It was quick, and lowered the risk of a fall on the stairs. The speaking tube located next to it (which couldn’t be used too loudly as it would disturb the dining party) again facilitated communication between floors without the need of running up and down stairs. Victorian diners knew servants were necessary to help run a household, but the less they were seen and heard, the better. The butler’s pantry, and the dumbwaiter, facilitated this separation between the servants and their employers. Although the term “dumbwaiter” may sound demeaning to modern-day ears, the old-fashioned name hints at the benefits of installing such a system – privacy, and a silent, labor-saving device that reduced hired staff. Today the term “dumbwaiter” often refers to the food lift seen here at the Nichols house, there is another type of dumbwaiter which more accurately describes the origin of the term. During the 18th century, a dumbwaiter was a stationary piece of furniture, whereas by the mid-19th century it referred to the contraption we have today. [ii] The 18th century version was a small, stationary table with shelves that would be left next to each guest at a dining table to serve themselves without the aid of wait staff. [iii] Each guest would have their dumbwaiter with all the food implements and courses already laid upon it. This style of “dumbwaiter” allowed guests to discuss important topics without worrying servants could overhear. At his home Monticello in Virginia, Thomas Jefferson not only had small wine dumbwaiters installed on either side of his fireplace mantel (in the style of the Nichols’ lift), but he also owned multiple stationary dumbwaiters as well for hosting private dinner parties. The Nichols House Museum now offers Servant Life Tours of the house- if you are interested, please give the museum a call at 617-227-6993 to arrange a special tour! [i] See B. June Hutchinson, At Home on Beacon Hill: Rose Standish Nichols and Her Family, for a description of the many servants, both male and female, who worked at the Nichols House. [iii]Visit the Monticello website to learn more about Thomas Jefferson’s entertaining and lifestyle at his home in Virginia: http://www.monticello.org/site/house-and-gardens/dumbwaiters and http://www.monticello.org/site/jefferson/design-and-decor-convenience.